If you are currently in crisis mode, please call your local suicide prevention hotline, or 911. You can get immediate treatment at your local emergency dept. Disclaimer: the following information contains resources that I have found helpful over years of dealing with depression. We are all unique, and what works for me may or may not help you. Please consult your doctor. There are many different types of depression medications. Your doctor will look at your health conditions, other medicines you’re taking, and your depression symptoms to choose one. Depression meds take 3-6 weeks to reach full effect. If the first one you try doesn’t help, there are many more. Everyone responds differently to medication, so it may take a while to find the best one for you. Hang in there! You will get through this darkness. Finding a therapist or counselor is so much easier today than it was 12 years ago, because you can do a Google search for providers near you. Most providers have a sliding scale, if they don’t accept your insurance, or if you don’t have insurance. If you have no energy, and don’t have someone to assist you, ask for a recommendation at your doctor’s office. It often takes several weeks to get your first appointment, so don’t delay calling. Your doctor’s office can make the call for you if you just can’t do it yourself. Or you can have a friend or family member call for you, but you will need to talk to the office staff before they’ll schedule an appointment. If the first person you meet doesn’t seem to understand your problem, or has a personality that clashes with yours, try another one. It can take time to find a good fit, but it’s worth it in the long run. Remember you are worth it!! You can feel better. It’s just going to take some time. Keep in mind, however, that therapy is hard work. It isn’t fun to talk about upsetting feelings, and events. However, keeping things bottled up inside is what got me to the place of being depressed. Be prepared for this. It feels like these strong feelings of sadness or anger will overwhelm us, and we’ll lose self-control. That didn’t happen to me, and it won’t happen to you. It just “feels” that way. Therapy is also a safe place to practice speaking up for ourselves. Competent therapists will not force you to talk about anything until you’re ready to do so. They’re also committed to not reveal anything you discuss to others. You can rest assured that what is said in private will stay there. If you live outside of the US, do a computer search for Crisis or Suicide Prevention Hotlines in your area. This article is a collection of tips from people who have depression. It contains some real gems of wisdom. There are also many more articles written by people living with mental illness on this site. Here’s an article I wrote earlier with tips for coping with painful emotions. The Depression and Bipolar Support Alliance (DBSA) is a wonderful peer-led group that exists to help people with mood disorders. If your depression is from Bipolar disease, please check out DBSA’s bpHope. It’s a website, and also a monthly magazine that covers all aspects of living with bipolar. In my opinion, it does a great job at providing encouraging tips for coping well with your condition. I’ve learned a lot from this site. DBSA also has a website, and magazine titled Esperanza that covers anxiety and depression. 2. Then there is “NAMI, the National Alliance on Mental Illness. It is the nation’s largest grassroots mental health organization dedicated to building better lives for the millions of Americans affected by mental illness.” They offer education classes, support groups, and advocacy in the U.S. When looking for faith-based depression resources, please keep in mind that depression is an illness, not a weakness or character flaw. You will find articles on the internet that will state or imply that if you had stronger faith, or stopped sinning that you wouldn’t have depression. Exit these sites ASAP. They will only add guilt and shame, and make it that much harder to heal. Trust me on this. We’ve covered a lot of territory, but have only scratched the surface of what is available to help you on your depression healing journey. I’ve provided these resources to give you a place to start or as supplements to what you’re already doing. Please share this information to your friends and family and on your sites. If you would like email notification of future posts plus access to my subscriber-only resource library, please enter your email below. 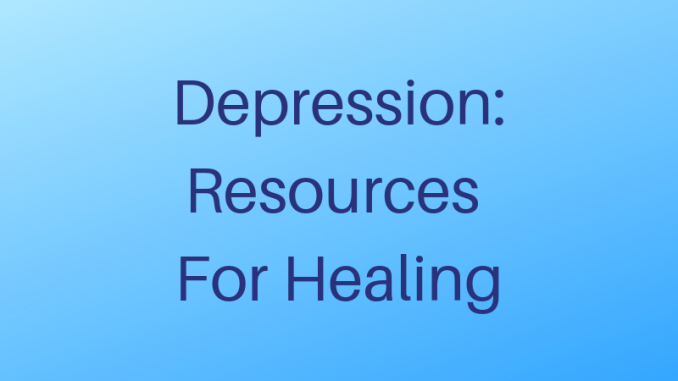 Kathryn, I know a lot of people struggle with depression, so this is a very helpful resource. Please share it around. Thanks for stopping by, reading, and commenting!! I absolutely love that you wrote this post! I personally struggle with depression and this is so helpful. The more we talk about this – the more chance we have at ending the stigma! I’m so glad that you found it helpful. Thanks for coming by, reading, and commenting! !